A surge in cheap solar power has been a boon to the developing world, where villages in Asia and Africa still lack regular access to light and power. About 1.2 billion people in the developing world still live without electricity. About 600 million of those are in sub-Saharan Africa, a continent dominated by European colonial powers for most of the last century. Hundreds of millions more lack ready access to power and the often life-saving advantages it provides. But building and connecting power plants is a multi-billion-dollar endeavor that can stretch the finances of poor countries and take years to complete. 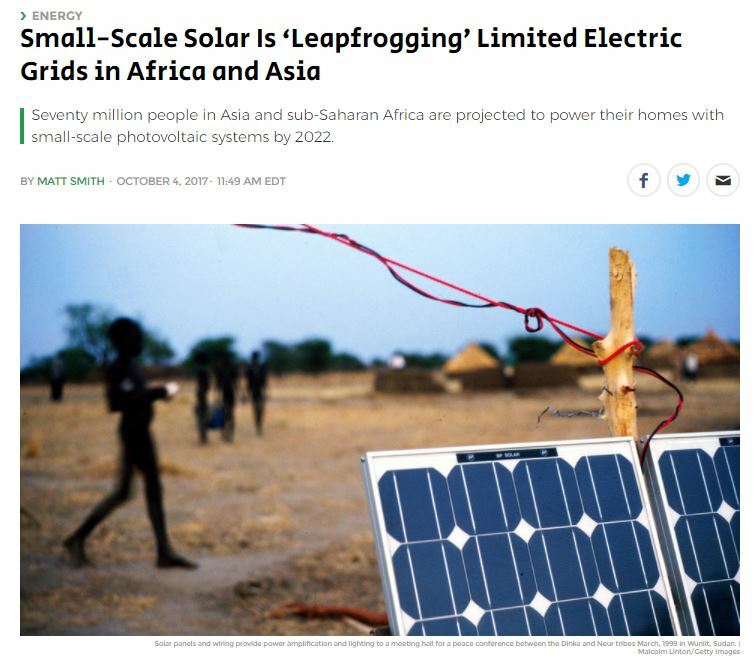 But individual solar installations or small-scale “micro-grids” can leapfrog over industrial-scale power projects the same way mobile networks gave millions of people access to communications faster than many countries could string telephone wires.